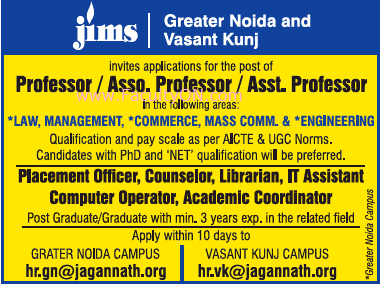 JIMS Engineering Management Technical Campus, Greater Noida has advertised for recruitment of Professor / Associate Professor / Assistant Professor Plus Non-Faculty jobs vacancies. Interested and eligible job aspirants are requested to apply within 10 days from 28th November 2018. Check out further more details below. About College: JIMS has state of art campuses that are prominently spread at eight prime locations in Delhi and NCR. Each successive year brings a new set of opportunities and by meeting those, JIMS continues to grow and improve. JIMS Engineering Management Technical Campus at Greater Noida is one of the Best Engineering Colleges at Greater Noida as well as in entire Delhi & NCR. It has well-developed campus at 6 acres of land with all modern facilities and amenities. The campus life is congenial, harmonious & offers opportunities to the students to pursue education and research / consultancy activities besides other co & extra-curricular activities. As per AICTE / UGC norms. Ph.D and NET qualifications will be preferred. How to Apply: Interested and eligible candidates are requested to send their application along with CV, one set of copies of certificates, copy of PAN card, copy of Aadhaar card and recent PP size photo to the email address provided here.